Claude-Francois Joseph Louis (Laurent) Receveur was the junior of the two chaplains on the Laperouse expedition which arrived in Botany Bay on January 26th, 1788, the very day that Phillip and the First Fleet were moving to Port Jackson. Receveur was born April 25th, 1757 in Noël-Cerneux, a village in Eastern France with a population similar in size to La Perouse. He was a Conventual Franciscan friar at a time when the Conventual Franciscan branch of the Friars Minor occupied the Grand Convent in Paris. A man of letters, he was amongst the 17 scientists who accompanied Laperouse, serving aboard L’Astrolabe as a naturalist, astronomer, botanist, geologist, chemist, meteorologist and philologist. Over the course of the expedition, there were numerous scientific explorations where Receveur figured prominently and which Laperouse recorded in his journals. These included the brutal massacre in Samoa which claimed de L’angle, senior scientist Lamanon and ten other members of the expedition, and left Receveur with, as Laperouse recorded, “a bruised eye”. In the final letter written to his brother while in Botany Bay, Receveur claimed that the injury had healed but within ten days he was dead. At every opportunity during the voyage he and his fellow scientists were in the field examining, collecting and recording their scientific discoveries. In Botany Bay their presence was met with hostility by the local aborigines. Receveur may well have fallen victim to that hostility or succumbed to unseen complications of the eye wound. In death he became the first scientist, the first catholic, and the first priest to be buried in Australia and the burial mass conducted by the senior priest and fellow scientist, Abbe Jean-Andre Monges, would have been the first celebration of the Catholic mass in Australia. The Laperouse Expedition departed Botany Bay on March 10th, and subsequently perished in Vanikoro. 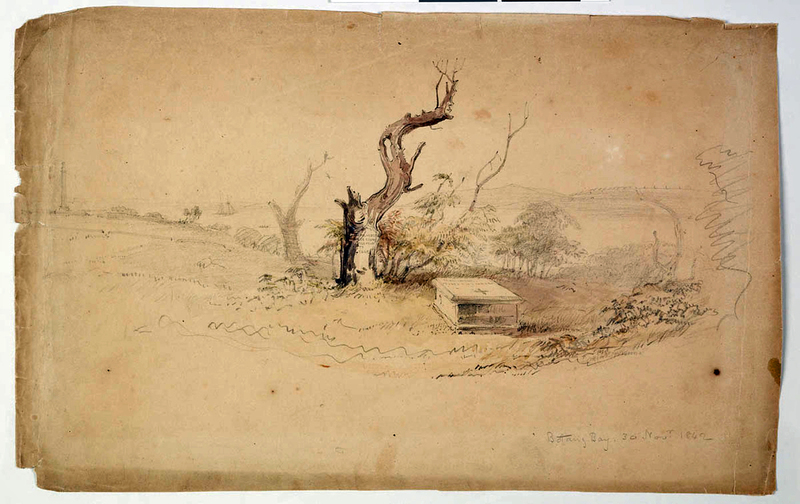 In March 1824, Louis-Isidore Duperrey visited the headland and a young French officer carved an epitaph on the trunk of the eucalyptus tree which marked Receveur’s grave. The tree was later removed and the engraved portion presented to France. 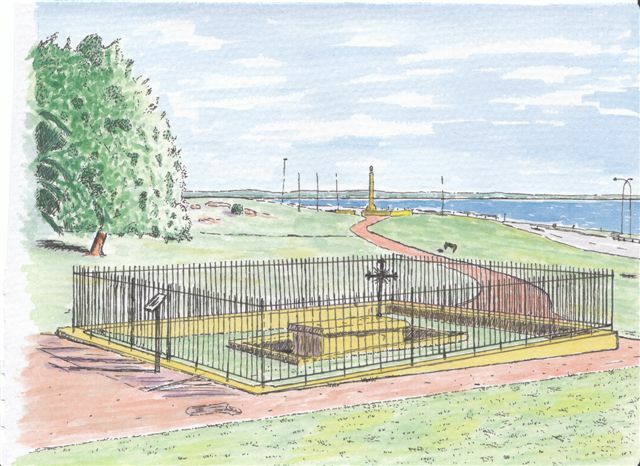 In 1825, while on a visit to Port Jackson, Baron Hyacinthe de Bougainville arranged for the construction of a monument to Laperouse and a Tomb for Receveur. The project was supported by Governor Sir Thomas Brisbane who allocated 176 sq. yards for the monument and 70 sq.yards for the tomb. In an official dispatch to the Minister for the Navy, de Bougainville wrote: “I discussed my plans with Governor Brisbane who welcomed them all the more since on the opposite side of the bay, he himself had recently arranged for a plaque to commemorate the arrival of the immortal Cook. H.E. had no hesitation in granting me the requested site and has kindly agreed to entrust the creation of the mausoleum to the government architect.” The tomb was completed in 1829. The altar stone that Monges would have used during the burial mass along with the engraved portion of the tree trunk, and a number of other items were given into the Laperouse Collection as a Bicentennial Gift to Australia by the French Government in 1988. The Collection is housed in the Laperouse Museum at La Perouse. Over the years many have come to celebrate mass on the anniversary of Receveur’s death.